Skipper Gemma Bonner rescued a point for Liverpool as they played out an enthralling 4-4 draw against Arsenal in the FA Women’s Super League Spring Series on Thursday. Fans were treated to an eight-goal thriller at the Hive, with both sides leading at different points of the topsy-turvy encounter. 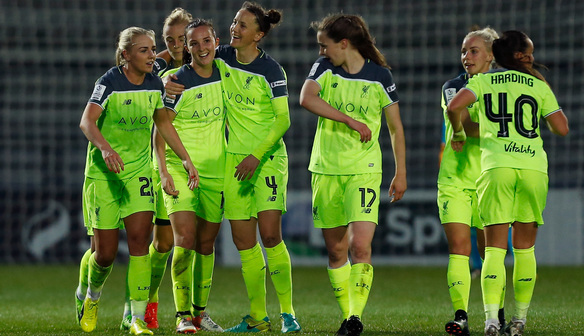 After an attritional opening phase, Liverpool broke the deadlock in bizarre fashion as they went ahead on 13 minutes through Alex Greenwood, whose whipped corner-kick sailed over everyone’s head and into the roof of the net. But the Gunners got their equaliser just after the half-hour mark as an early cross was fired to the near post, where Chloe Kelly was on hand to finish. Liverpool however quickly claimed their second when Sari van Veenendaal smacked a clearance against Tash Harding and straight into her own net after a corner. The Reds somehow squeezed in another a minute later to make it 3-1 at the break, as Caroline Weir buried a header from Niamh Charles’ dangerous cross. Danielle Carter gave Arsenal hope just after half time when she lost her marker, dropped the shoulder and fired low past ex-Gunner Siobhan Chamberlain. And the hosts completed a remarkable comeback through Carter again, as she curled home from a similar position on the hour. Arsenal looked to have clinched a stunning winner through Jordan Nobbs, who guided a shot into the corner after a brilliant flighted ball in, but Liverpool had the last laugh as captain Bonner glanced a header into the net from Greenwood’s corner. “I think the Spring Series is a time to give confidence to the young players for us. “Obviously we thought we won that result – we thought we had it, but in the last minutes it was a draw. Great merit, in my opinion, for the girls. “They reacted very well, it’s not easy. We showed the Arsenal character so I can only be proud of what we did today. “Obviously we wanted a better result but Liverpool was a very difficult opponent and I think both teams showed what they are capable of. “We tried to be compact in the middle. I think we controlled that part of the game well. We conceded goals from set plays and sometimes things are unpredictable. “It was absolutely crazy. I kept looking up at the scoreboard to see what score it was. “I suppose it is entertaining for the fans but for me I would have liked to have a clean sheet and not concede four. But we’ll go home and view it and we will see where we went wrong to concede those four goals. “I think we dominated the first half, I thought we were the better team – absolutely. We kept possession really well, but credit to them, they got themselves back into the game. “I thought Dan Carter had an excellent game down the left for them and she was influential. “I’m not sure what I put surrendering the lead down to. They stepped up a gear, we dropped off because it was 3-1.